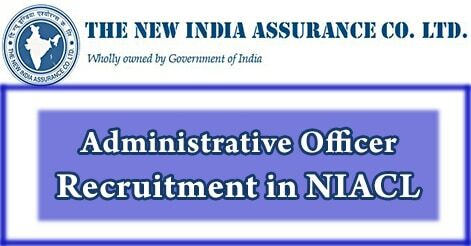 Through NIACL Administrative Officer (AO) Recruitment 2019, New India Assurance Company Limited invites eligible and proficient individuals to fill and submit the application form for 312 vacant positions of the post of Administrative Officer (AO). Those who are interested in said notification can check Exam Notification, Eligibility, Salary details from this page. The application form is available at the official website from 10 December 2018 to 26 December 2018. The selection of the candidates will be made through Written Exam and Interview. The Phase-I Online Examination (Objective) has been scheduled on 30 January 2019 and Phase-II Online Examination (Objective + Descriptive) will be held on 2 March 2019. More details regarding NIACL Administrative Officer (AO) Recruitment is available below. Hit on the “Recruitment” link available at the bottom right of the home page. Now on the next page press the “Recruitment of Administrative Officers 2018” link. Thereafter hit on “Detailed Advertisement for the Recruitment of 312 Administrative Officers (Generalists and Specialists) (Scale I) 2018” link. Now read the details and fill the application form as per the prescribed details. Pay the fee and upload the scanned copy of the required documents. Recheck the form and submit the fee.